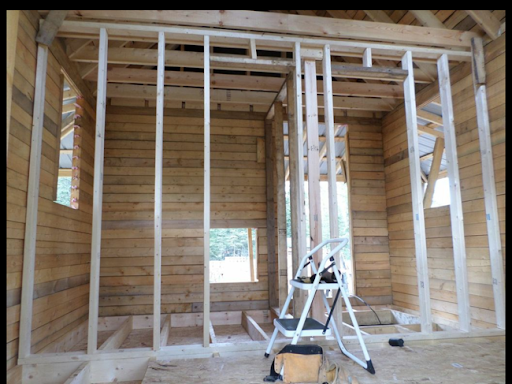 With the walls for the sauna framed in, it was time to get down to putting in the electrical components. From the cabin site, I had run two extra wires to provide power from the cabin to the sauna (via my solar panels and batteries), and then a second wire to provide power from the sauna back to the cabin (so that I could run the generator out on the far side of the sauna, and have it charge up the batteries in the cabin). The latter cable simply needed appropriate ends put on it for now. The former, I wired up directly into the sauna's walls. I placed three switches inside the change room, one for each room of the sauna (change, washing-up, and steam). In the change room I also added a light. In the washing-up room, I put in a single light, a single GFCI outlet, which seems to work fine on my modified sine wave, as well as two switches. One of the switches was an older timer switch I brought with me from Kitchener, which worked on the modified sine wave as well. The new timer switch I bought didn't like the modified sine wave, so I just put in a regular switch there. These two switches are for my water system. The timer switch is hooked up to my heating cable down in the well. I can run it for up to 30 minutes at a time. We'll hope that we never have to use it! The other switch just runs the water pump. We'll just have to turn it on and wait a bit for the water tanks to fill. I will have to see how this ends up working for us. The GFCI outlet is mainly for the washing machine, but should also give us the ability to plug in something else if required. In the pictures, the mix of black and white wiring is due to me having some extra 12/2 wire from the pump, which I wanted to recycle as best as possible. 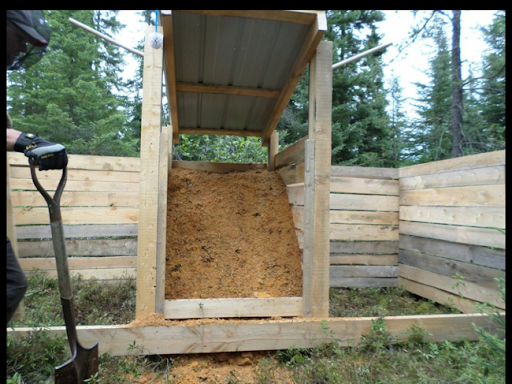 The turd tower, the poo palace, the colon cabana... Over supper we worked hard to come up with different names for a permanent place to store our sawdust and compost our kitchen scraps and nightsoil production. Kenny enjoyed learning about alliteration, and took to our game with great gusto. Recently we have simply been dumping everything in an area bounded by a number of trees and marked off by some bright orange snow fence. During winter we had quickly filled the pole and pallet frameworks I had built, so as an emergency measure, I marked off the trees with some cheap snow fence, and we began using that. It worked well, even if unsightly, and there wasn't much compunction to change it. 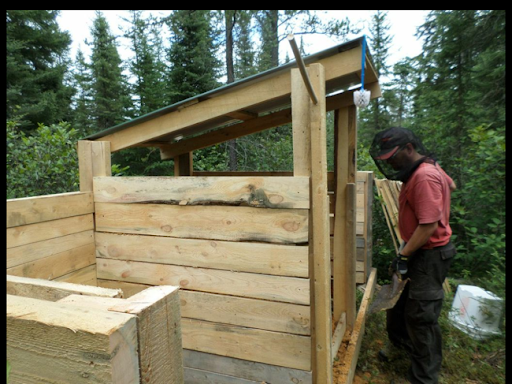 One big drawback though was that the sawdust generated back at the sawmill was completely exposed to the elements, and was getting more and more soggy and less and less useful as a covering agent. I also knew that eventually the snow fence area would fill up, and I would have to find a new location to dump our buckets. Having seen some pictures of other people's "Humanure Haciendas" online, I had a fair idea of how to construct one. Kenny and I gathered together a bunch of my rough cut 2"x6" boards, and then yesterday Grandpa and I cut them to size. 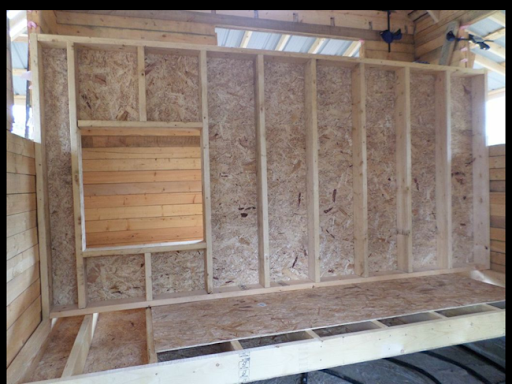 I opted to make the entire structure 13' feet wide, as that matched the longest boards I had at the moment. I then made it 5' deep. We divided it up into three sections, the two outer ones were 5' wide, and then the centre section remaining was 3' wide. I put in posts in the outer corners that were 4' high (I wanted initially to go higher, but then realized that 4' was about as high as one could even remotely, comfortably hoist a bucket). 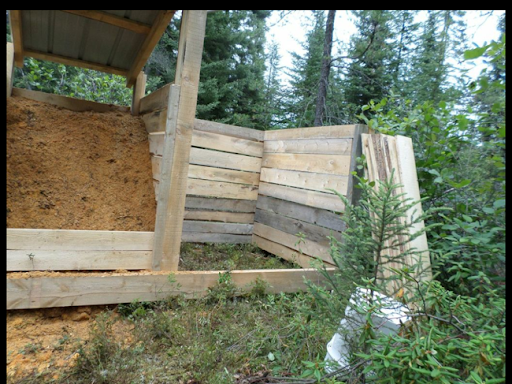 On the inner, 3' wide section that was to be dedicated to storing the sawdust, I put 5' posts in the back, and 6' posts in front. 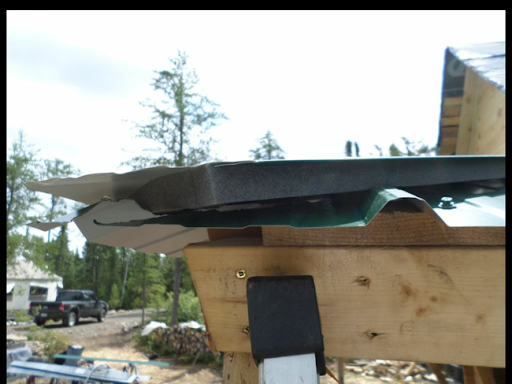 Then I covered it with a leftover piece of steel roofing from the sauna. 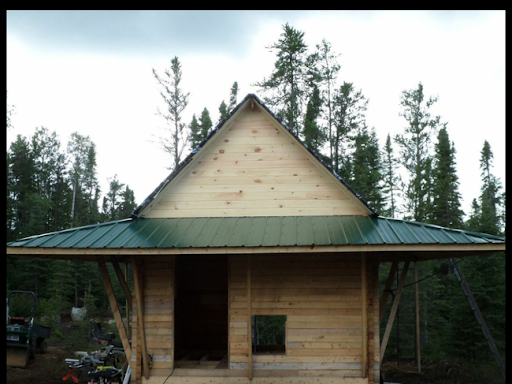 This gave it a nice sloping roof to shed most rain, although the top foot or so was unprotected at the sides. I'm hoping that it still will allow the sawdust to dry, and remain mostly dry. I used scrap 1" thick boards to box up the sides and back, and then cut more boards to use in the fronts, where we would insert and remove them as needed. 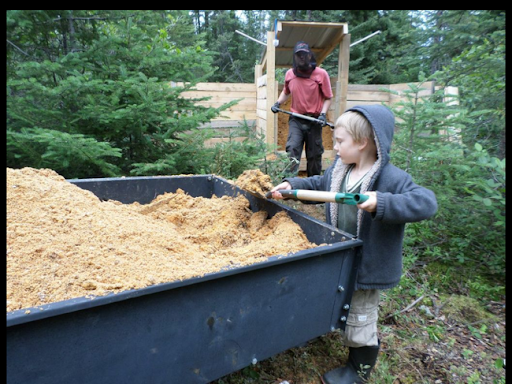 The rest of the day was spent hauling the sawdust pile from the sawmill back to the hacienda. 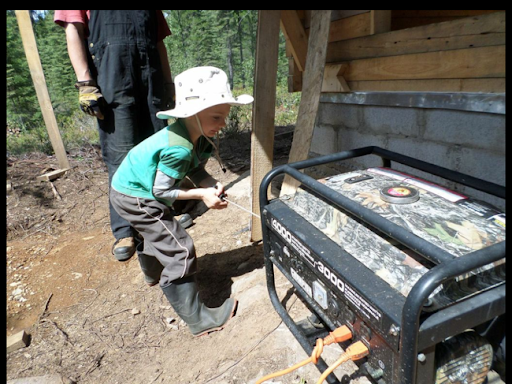 Kenny was eager to help at this point, until the bugs got to be too demanding, even for him! 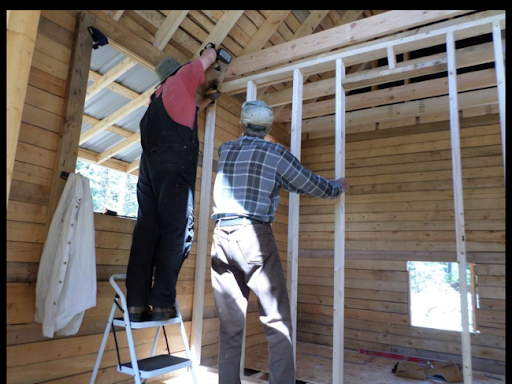 With the roof on and us able to depend on the insides of the sauna being a bit more weather-tight, Grandpa and I opted to spend the other day working up the interior walls. Framing these in was delightfully simple. The main wall was designed to run through the centre of the sauna, so it rested directly on my double two by six inch floor beam. 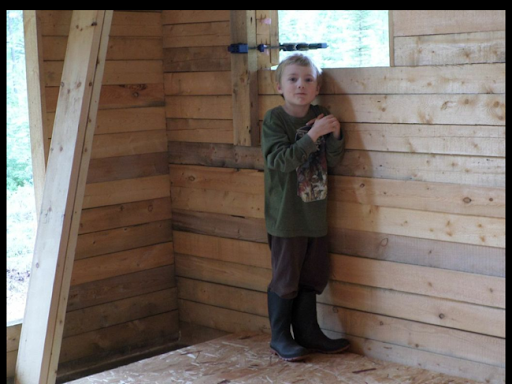 We built the wall to come up about 2" below the loft. Grandpa and I agreed that this seemed a reasonable amount to deduct to allow for settling of the building over time. 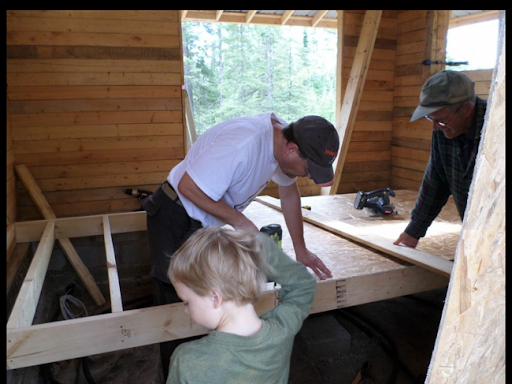 Once I can see that the sauna is no longer settling, I will shim the top of the wall and seal it up. Kenny was rather excited to see us hoist this wall into place. He came over and began chanting "Aud-i-ence!" and clapping. Not sure where that came from. The greatest debates revolved around the size of the interior doors. Both Donna and I were happy to keep them rather narrow, and that's what we did in this case. I roughed them in to be about 24" wide and about 6'6" high. Small by any conventional standards, but probably average for a sauna. Next it was fast work to put up a short wall perpenticular to this wall, to separate the steam room from the change room. 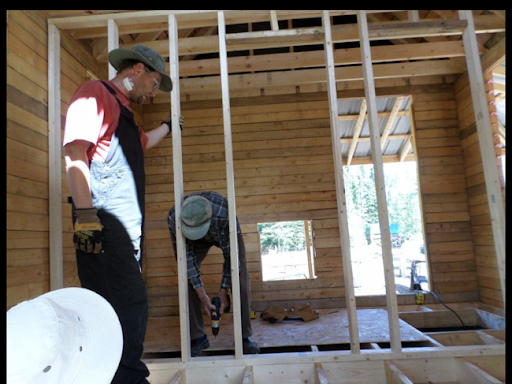 There was no door in this area, so it was a simple matter to build a frame wall and attach it to the first one. Neither of these walls was screwed to the main structure of the sauna. Again, this was to allow for settling. Now to get the windows ordered so that we can insulate and close up the floor. After a tough day up on the roof of the sauna, Mummu was kind enough to let me take a shower and change my dressing at her house. She pulled off the old dressing, taking a few beard hairs with her I'm sure! 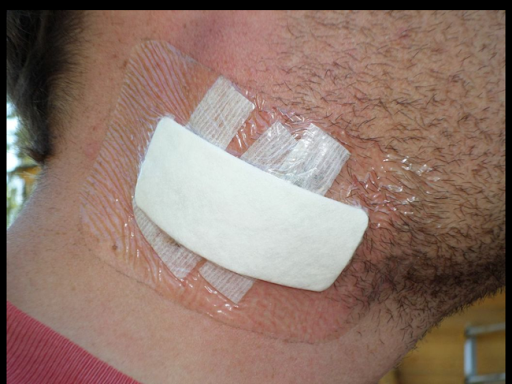 I remarked that I imagined that was what waxing must be like, but she commented that I really didn't have a clue. Donna threw on a clean one, and I'm back to work, full throttle, and lighter by a few grammes thanks to my surgeon. Still looking for sympathy from my recent surgery, I begged off working in the morning yesterday, and instead told Grandpa I would be a real go-getter come afternoon. At the duly appointed time, we discussed a plan of attack, and it was decided that I would head up onto the roof, and Grandpa would cut and pass up the flashings for me as I required them. I set my bar low for the day - I would be happy if I could get some or all of the flashings installed. I figured that they were going to be the most difficult part of the remaining roof work. 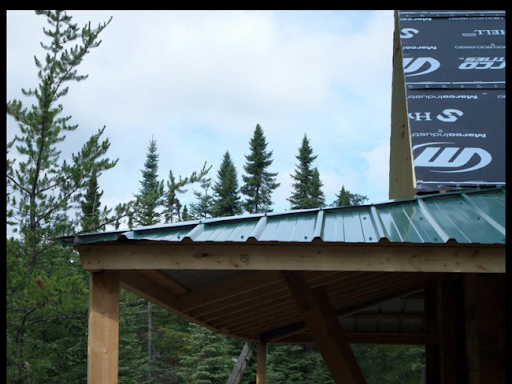 First we cut the endwall flashings, where the steel roof meets the gable ends of the sauna. 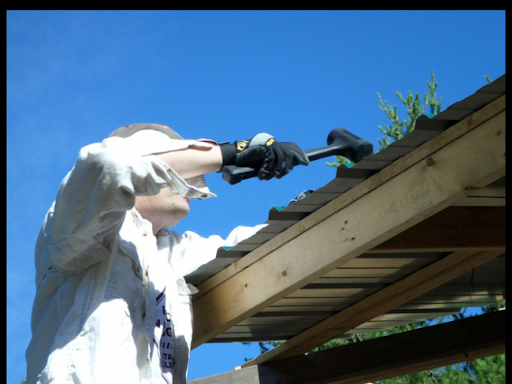 Under these flashings I also stuck down some "large tab" foam closures, to ensure that pests and debris couldn't make their way up under the flashing and against the sauna, or back under the porch roof. Then I screwed the flashing tight to the gable end wall, at about every other rib. On the porch roof itself, I screwed through every rib. At the opposite gable, the flashing extended up into the window opening about a centimetre or so, but nothing unreasonable, and I'm not going to do anything about it until I actually begin installing the window. This went marvelously smoothly, so we decided to continue on with the "transition flashings". 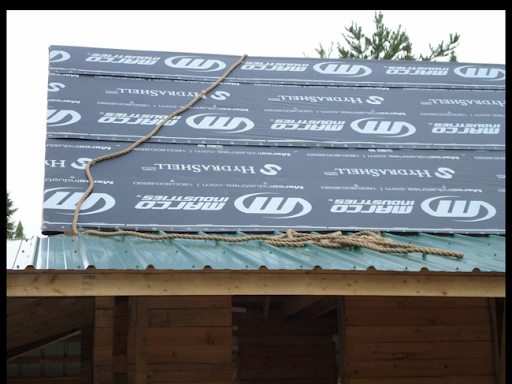 These are the flashings that are suppose to take us from one roof pitch (12:12 for the main roof) to another roof pitch (a wild guess at 4:12). I screwed down the porch side of the flashing first, which made the roof side stand up off the decking. Grandpa and I judged this to be a minor issue, as the weight of the roof panels would surely press the transition flashing down flat against the roof deck - a prediction that later came easily true. 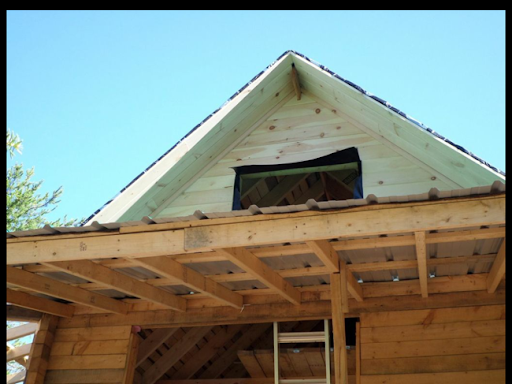 While we had extended the eaves of this roof out from the ends of the gables, we didn't try to attach the overhang to the porch roof below. I don't see any reason to do this at all. 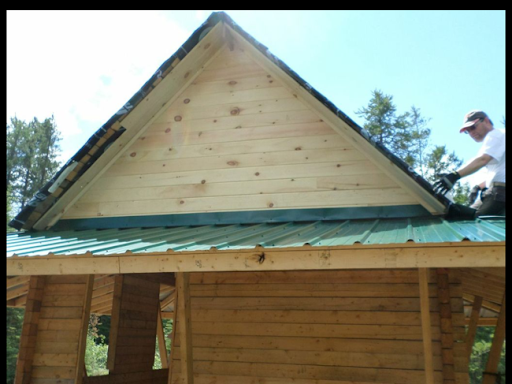 The porch roof extends under these eaves, as does the hip flashings of the porch roof. 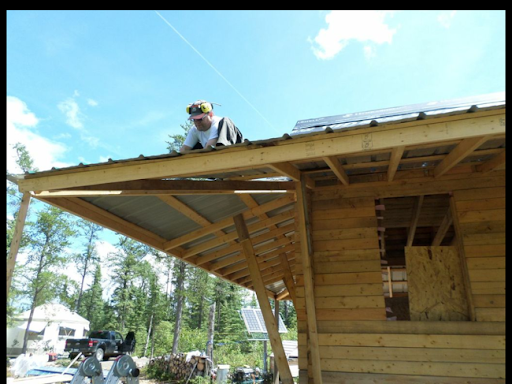 I did run the transition flashing all the way from one end of the roof to the other, so at the ends of it, it is hovering over the porch roof for a foot or so, unsupported and unfastened. I can't see this being a problem, and it certainly isn't an aesthetic problem. This flashing also went up with remarkable ease. 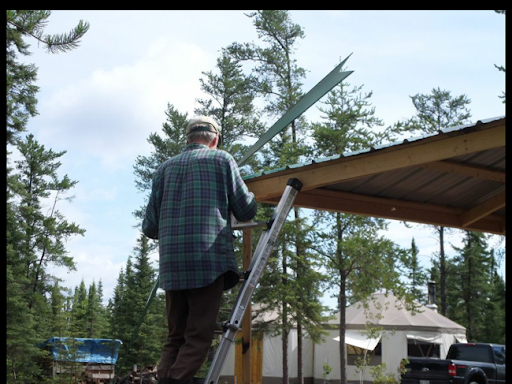 Grandpa was game to help me install at least one of the roof panels, so we carried them over to the sauna, and together hoisted one up and placed it on the roof. Carefully guestimating the overhang (a theoretical 1-2 inches) we squared it as best we could to the horizontal portion of the roof. 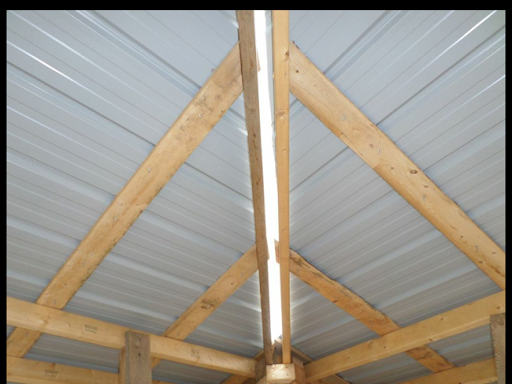 As I have already described, the sauna roof is not perfectly square, so we anticipated that the ends of the roof panels would not be completely parallel to the ends of the decking. 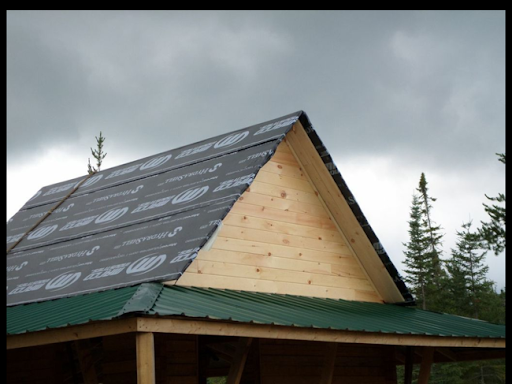 Also, under the first panel and along the gable edge, I installed a drip edge flashing to sort of box in the ends of the roof boards and v-joint boards. 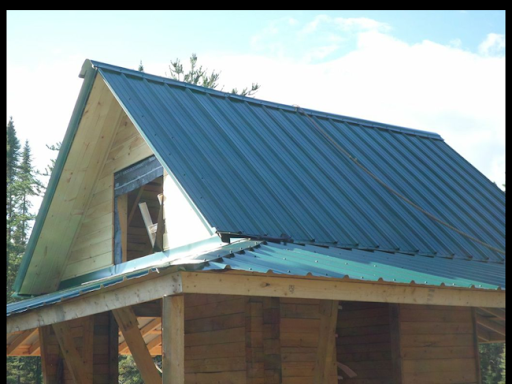 This drip edge was surplus material in a more turquoise colour - but under the shadow of the roof panels it is very difficult to notice the difference, and it looks just fine I think. You can look carefully at the pictures to try to pick it out if you like. The panel went up well, but just to be sure, I only screwed it in with two or three fasteners along the bottom edge. Grandpa headed down to terra firma, and passed up another panel which I set and fastened myself. We continued in this fashion for the next four panels, at which point I had completed one side. Of course, there was a hitch - the panels, while covering exactly thirty six inches as part of a group, are actually close to thirty-eight inches if you count the overlapping rib built into each one. This meant that when I got to the front of the sauna, I had closer to four inches of overhang. It was too much. 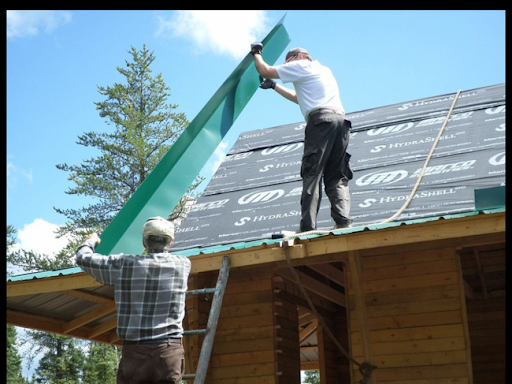 Our options were to cut off the last rib of the panel, or try to shift all the panels back across the roof to even out the overhang to more like three inches at each end. 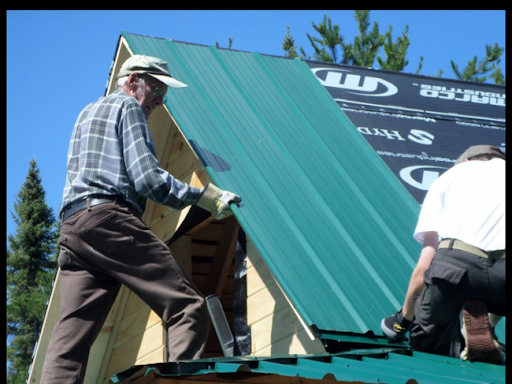 Considering how difficult cutting a rib off and keeping a nice edge, as well as having to do it on both sides of the roof to make it symetrical, I opted instead to move all the panels backwards across the roof. I installed this panel where I wanted it, and then went back to all my previous panels, unscrewing them and sliding them into a new position. Thank goodness I opted to only put in two screws on each one! This worked well, and set us up for the far side. Now we had a better idea what the overhang should be, so that side went even faster! 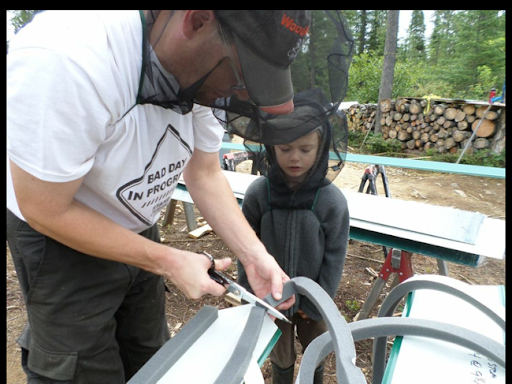 Now Grandpa was on a mission, and began cutting up the ridge cap and foam to seal it up. 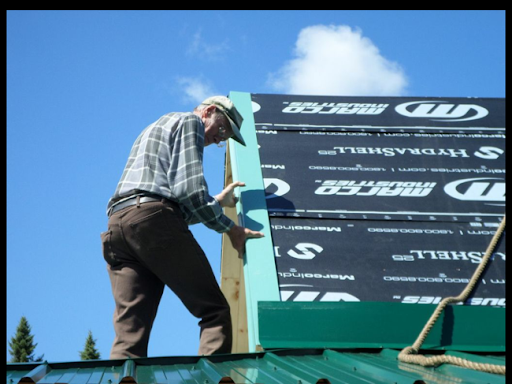 As he did this, I went back along the roof panels, adding many screws to hold them firmly in place. On the gable ends, I put in a screw every twelve inches. We took a break for a delicious supper at Mummu's - her famous chicken and rice dish. I had seconds, and then my stomach suggested I take a break. My taste buds sure didn't want to, and I regretted not gorging myself more later in the evening when I had returned to the yurts and began salivating again, thinking about it. Oh well, we can't nurse our regrets forever. 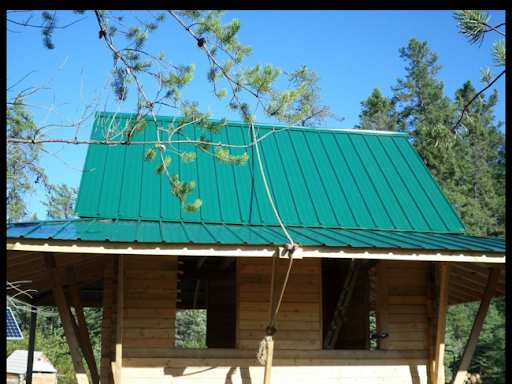 After supper, Grandpa and I returned to the sauna, and in short order I climbed up onto the roof, then used the rope to drag myself to the ridge. Straddling the ridge, I couldn't help but feel chagrined at how my hips complained about being held at a ninety degree angle. Back during my aikido heyday, I could occasionally approach twice that! In any case, I put a screw on every rib to hold down the ridge cap, and had it fastened down in only a few minutes. I think things turned out really well! It's almost disappointing now that we have a forecast that DOESN'T call for rain any time soon. Likely the first time this summer we've seen that. 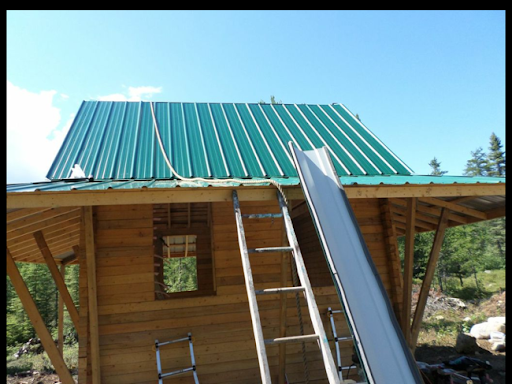 After the rainy day pushing us towards starting the sauna floor, we had a clear day encouraging us to get back to the roofing. To help us to feel more comfortable on the roof, Grandpa and I installed a rope that we could swing from for extra leverage. 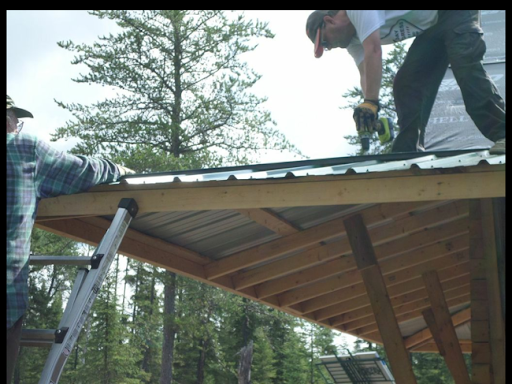 Installing the hip flashing over the corners of the porch roof proved to be a 90% single man job, with a second person required just to help align the corner for the first few screws. Once again Grandpa went to work landscaping out the areas where puddles from the previous rain were visible. He was gracious enough to interrupt his work for a few minutes each time I tried to align the hips. The hip flashing was rather straightforward to install. 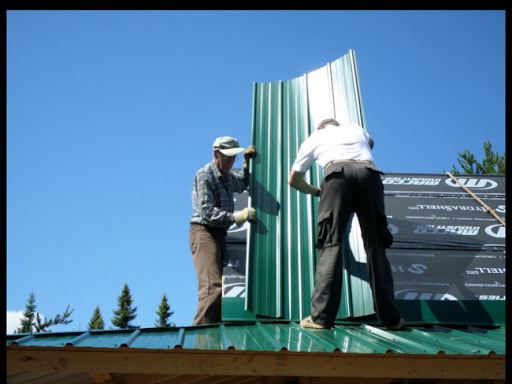 I cut a V in one end of the flashing, headed up on the roof and pressed it in as tight as possible at the top of the hip - taking care to ensure that it covered from one side of the corner gap to the other. 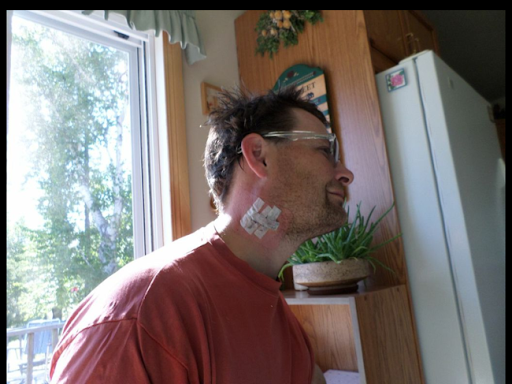 Then Grandpa marked under the bottom corner for the cut there. 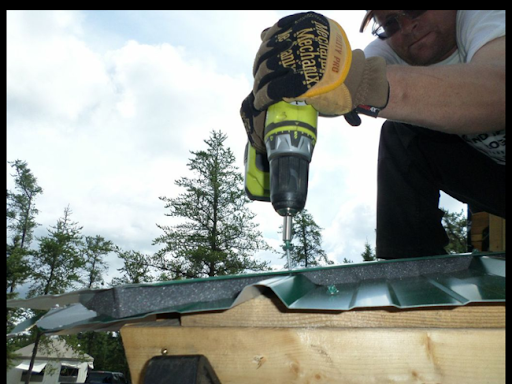 I climbed back down off the roof, cut a point at the bottom, and then used some self-adhesive "universal foam" under the hip flashing to ensure that pests wouldn't have a gap to get from above the roof to below. The hip would naturally shed water and snow, but there would still have been a space between the flashing and the bottom of the steel otherwise. 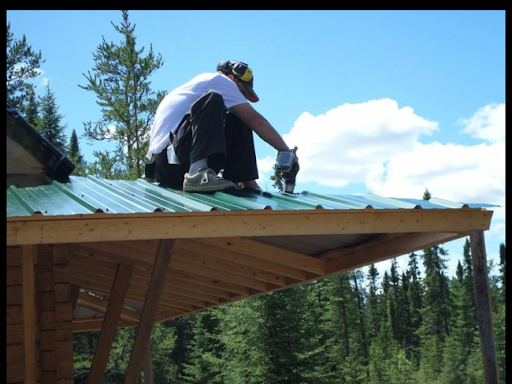 Once again Grandpa ensured that the bottom of the hip flashing was over the corner of the roof, and I drove screws down through the hip and into each rib of the steel roofing. Driving the screws through two layers of steel was slightly different than on the main part of the roof where it was a single layer of steel over wood. 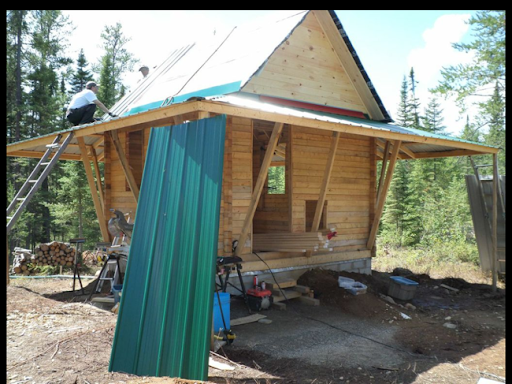 I found it was fairly beneficial to put my full weight behind the screw as I was drilling, to help prevent the screw from "lifting" the hip flashing off the roof until the screw bit into the rib of the lower steel. The hips certainly accentuated any imperfections in the junction between the two roofs, but it wasn't as noticeable from down below, especially if you weren't specifically looking for flaws, so I'm not getting myself worked up about it. With the hips complete, now I just need to find a day that's clear enough, and with me in physical shape enough, to get up on the roof and install the endwall and transition flashings. 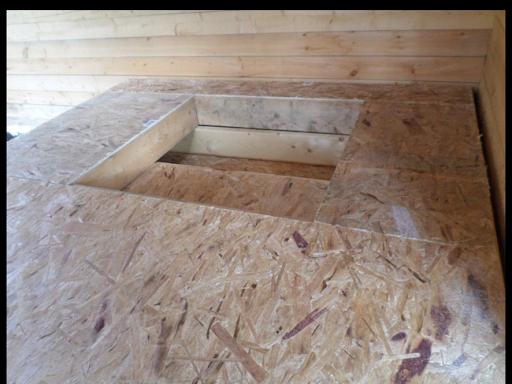 I don't want to begin to insulate the inside of the sauna until I am certain that it will shed water everywhere. Once again it was raining so we decided to work indoors on the sauna floor. 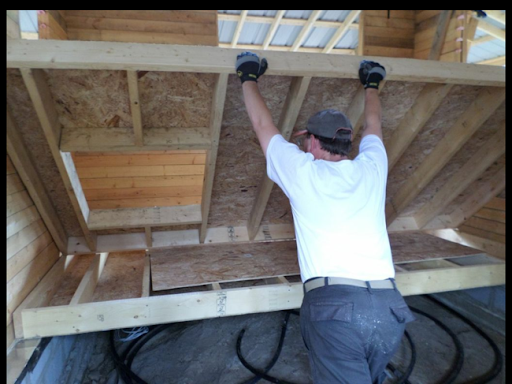 I had planned on having six inch rafters and fully insulating the floor. To ensure that pests could not get up into the insulation from below, I had purchased some 1/4" OSB. 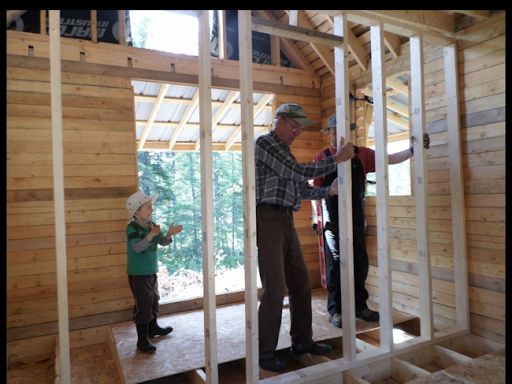 First Grandpa and I built a six by twelve floor and Kenny used the nail gun to fasten the OSB to the bottom of the joists. 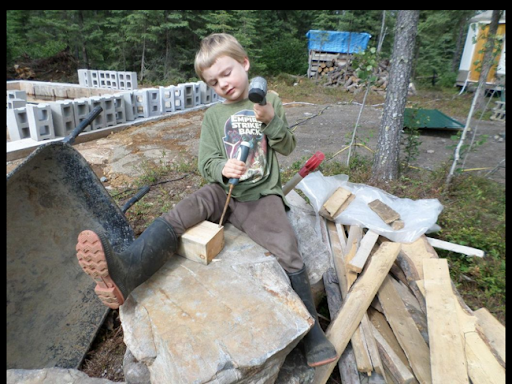 This concept of enclosing the bottom insulation was first suggested by Mummu, and readily accepted by Daddy. 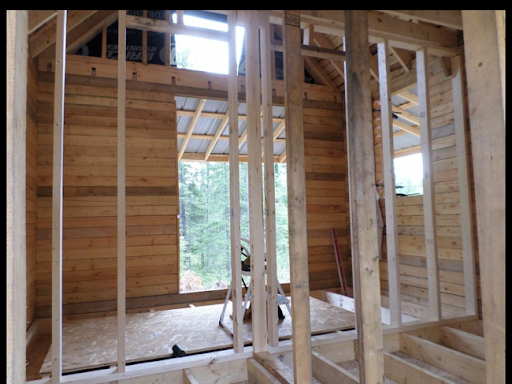 I do have a concern that OSB is somewhat of a vapour barrier on its own, and I don't want my insulation trapped between two vapour barriers. I'm hoping that such thin OSB will still permit a bit of air flow. 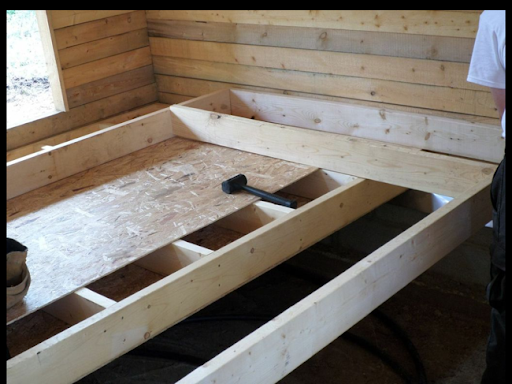 Logistically, putting the solid barrier on the bottom of the joists made things a bit more difficult, which is why we opted to build the floor in two sections. This actually worked out very well. It meant that there was a built-in "beam" through the centre of the sauna. 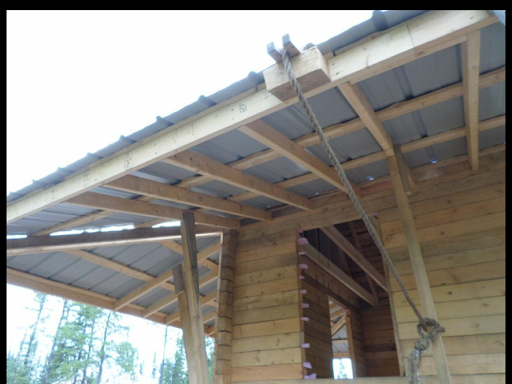 I had poured a small pad in the centre of the sauna, which I will finish off with a post up to the twinned joists from the two halves of the floor. It took us to lunch to complete the first floor section. Grandpa had some of his own chores to pursue in the afternoon, so once he left, I went out in the bush to heave up my breakfast (yes, still reeling from that blue cheese fiasco) and then headed to the yurts for some ginger ale and tea. 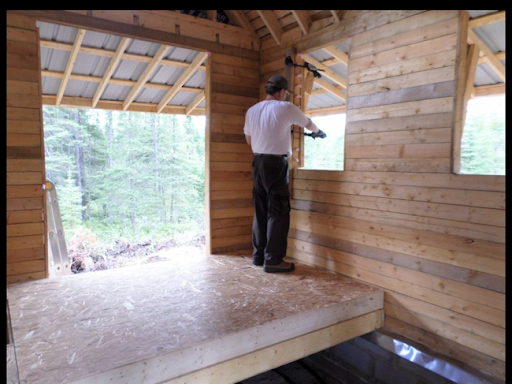 Shakily, I returned to the sauna and allowed myself a relaxed pace at building another copy of the floor we had built in the morning. 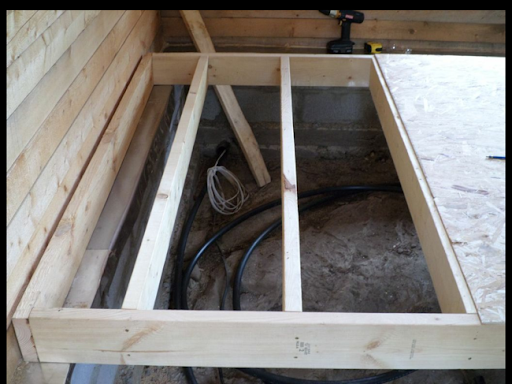 The big difference this time was that I framed in a trapdoor to access the crawlspace in the future. I see myself needing to get there at least twice a year to deal with ventilation under the floor, as well as if I ever need to get down there in the future to deal with plumbing or wiring issues. Feeling my oats, after I had assembled the entire floor, I thought it would be impressive if I could flip it and place it by myself. This turned out to be more difficult than I had hoped, but less difficult than I had feared. I could see how it could have been (was) somewhat dangerous though. Trapped in such an enclosed space with a precariously balanced floor was slightly unnerving, and I must confess that when the floor finally flipped, I jumped for it and wound up with a slightly skinned knee for my trouble. Grandpa heard the thump from his property, and came over just in time to help me slide the second floor into place. This was also a bit of a dicey proposition, as the tolerances were tight. It probably wasn't a single man operation, and with his help it went fine. 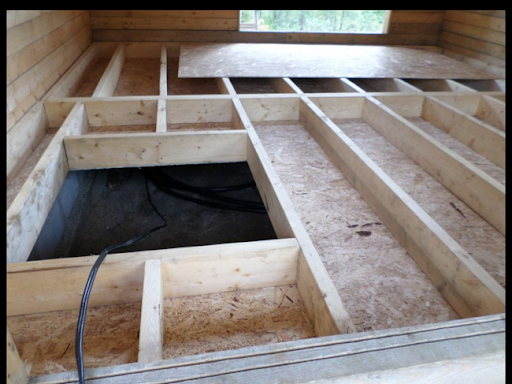 I even had two extra pieces of OSB to put down for us to stand on and enjoy the feeling of a floor under our feet. Kenny also found a break in the rain to be a good chance for him to take up a new hobby in woodcarving. Ugh. This was definitely a bad day in progress. Of course, it was only an internally poor experience. I did manage to continue with the same techniques to complete the roof. All my problems began when I came in for lunch and decided to release Donna from any responsibility to feed me. Instead, I opted for a bag of potato chips with some Buffalo Wing (Blue Cheese and Jalapeno Pepper) dip. As I approached the bottom of both the chips and the dip, my stomach suddenly revolted. I managed to supress the insurrection, but there still were ongoing tensions the remainder of the day. This really made it difficult to have much fun. Trust me, even people who like blue cheese and jalapeno probably don't like the feeling of it burbling onto the back of their tongue all day. That feeling, combined with the knowledge that I was going under the knife in a few days, didn't help to improve my mood. This feeling of low-level nausea persisted until after surgery - so it made for a slightly miserable few days. Anyway, I persisted on the roof and finished the basic installation by myself, in only two days. Then I took to my sick bed for the rest of the evening. Until the morrow, here's the picture of me driving in "The Last Spike".